“What? Another recipe?” I hear you cry. Yes, it is the truth. Once again I have conquered the demons of the kitchen and returned triumphant with a tasty dish fit for two guys to eat on a Tuesday night. I’m trying to make Tuesday be my “cook for the parents” night, and so far it’s working, though this week Mom’s out of town visiting relatives and so it was a guy’s night … um … in, I suppose. Before I get too far into this, I have to brag on my dad – he’s pretty much the best kitchen help I could possibly hire. Considering I don’t have any spare cash, my help would have to work for free, and you just can’t find good employees for free anymore. I guess that’s what’s at the root of the word employee, after all – the word employ, from the French, trompe l’oiel, which means to pay people to sit around in such a way that it appears they’re actually working. Anyway, Dad’s a great help in the kitchen because he and I seem to know how to work without getting in each others way. He has a knack for knowing what I’ll need next without me even having to ask, and he’s a pro at cutting tortillas into 1-inch strips. That’s actually what they had him doing in the Army for three years. He has war stories about guys losing fingers during the Corn Tortilla Conflict, dull knives, stale tortillas … it’s horrific. I guess I should get around to the recipe part, yeah? Oh, hey, but listen – I have pretty much decided that I hate corn tortillas. The soft warm and almost sweet goodness of flour tortillas wins out every day, in my not-so-humble opinion. Next recipe in which I am involved that calls for corn tortillas is gonna get a rude awakening when I mix it up all crazy-like. I found that the corn tortillas in this recipe detracted from the flavor of the rest of the dish so TO HELL WITH CORN TORTILLAS, I say, AND DAMN THE TORPEDOES. 1 cup shredded white cheese or maybe if you’re me you opt for Mexican 4-cheese blend, which tastes just like all the other bagged pre-shredded cheeses at the grocery store. 1.) Sautee the onions in a little bit of oil until translucent, maybe 3-4 minutes. 2.) Throw in the garlic, cook for 1 minute. 3.) Add the chicken, cook for 30-45 seconds to warm it up a bit. 4.) Put chicken, garlic, and onion in a medium bowl and stir in the black beans. 5.) In the skillet, bring the broth and the salsa to a boil, and then turn it down to a simmer for a few minutes. Stir occasionally. 6.) Grease up a 9×12 baking dish. 7.) Make a layer of tortilla strips, using half the strips at your disposal. 8.) 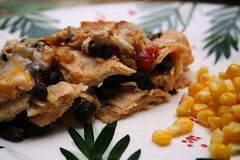 Make a layer of chicken-bean mixture, using half the chicken-bean. 9.) Repeat steps 7 and 8. 10.) Pour the broth-salsa mixture evenly over the casserole. 11.) Top this with the cheese. 12.) Bake at 450 (you pre-heated your oven, right?) for 10 minutes, or until cheese is all golden and bubbly. Eat eat eat eat eat. I served with corn, because black beans and corn entered into an alliance in the year 450 CE and declared that they would always taste great together and work as a team on any plate. Man, I totally need to go to bed. very amusing story, my friend. cheers to letting my day end in smile. Kevin, did you know that, as well as tasting great together, that beans and corn (or any legume and any grain, as far as I know) when eaten together provide all the amino acids to create a complete protein without meat? Which is why many indigenous people cook with those combinations. Not stated nearly as humorously as what you wrote, but, to my knowledge, true. I’ll have to try this recipe sometime. It sounds good – even for a “girl”. Hello Kevin. Patrick and I are going to be in Cookeville from Nov. 29-Dec 2 and we would love to see you.